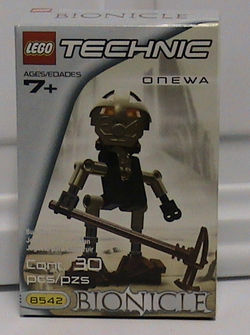 8542 Onewa is a BIONICLE set released in 2001. It includes Turaga Onewa, the Turaga of Po-Wahi. It also includes the Stone Hammer, Onewa's Badge of Office. A lever on his back lets him him raise and lower his hammer. He wears the Kanohi Komau, the mask of Mind Control. Onewa can be combined with Vakama, Matau, Nokama, Nuju, and Whenua to make a Turaga-Nui. Vhisola wears the same mask as Onewa.